Please note carefully the deadline dates below. January 12, 2020 – File Completion deadline (transcripts and test scores must be received by Graduate Admissions or postmarked by this date). Items received after this date will not be processed. Prerequisite completion of at least one course in statistics, one course in biological science, one course in physical science, one course in behavioral/social sciences, and one course in American Sign Language. Deficiencies in these areas may be completed after admission to the program if approved by the Admissions Committee. The number of new admissions is targeted at 10 students per year selected from a pool of qualified applicants. Therefore, admission is based on consideration of all application materials and the relative merits of individual applicants among all eligible applicants. Students are admitted in the Fall only. Begin the process early to assure consideration of your application. Admission decisions are made in late February. Notifications of admission decisions are emailed shortly thereafter. The AuD program does NOT allow deferred admisssion. Admitted students who are unable to begin the program in Fall 2019 must reapply in a subsequent year and will have no guarantee of being admitted. Graduate admissions is a 2-step process. The 2 steps are completely separate – what you submit to SDSU, such as transcripts, is not shared with CSDCAS and vice versa. First, you must apply generally to the University via the CalState Apply application by December 15. You will follow the status of this application, as well as receipt of your transcripts and GRE scores, via WebPortal. You will be sent instructions for setting up your WebPortal account and your SDSU Red ID after you submit your application. The application fee is $55. Second, you must apply to the individual department via the Communication Sciences and Disorders Central Application Services (CSDCAS) by January 12. You will follow the status of this application, such as receipt of letters of recommendation and transcripts, via your online CSDCAS account. CSDCAS charges $128 for the first program chosen and $51 for each additional program. All admission materials are initially sent to SDSU only. If admitted, an application to UCSD (with fee) will be required as instructed by the program at a later date. Complete the CalState Apply online application. There is a $55 application fee. Indicate “Audiology (AuD)” as your Major/Program Objective. Indicate “Doctorate” as the Degree Objective. NOTE: The CalState Apply online application (Step 1) must be submitted before submitting the online supplemental application (Step 2). Approximately 10-15 days after submitting the CalState Apply application, SDSU will email you your permanent Red ID number and instructions on how to set up your WebPortal account. A WebPortal account is the primary SDSU e-Services online account used to access important student services, including Application Status Check, Updating Email/Address, Applying for on-campus housing, and My Registration Information. Receipt of your Red ID indicates that Graduate Admissions has received your CalState Apply application, has set up your electronic file, and is now prepared to receive and process your transcripts. DO NOT BEGIN SUBMITTING TRANSCRIPTS UNTIL YOU HAVE RECEIVED YOUR RED ID. NOTE: As you will be submitting an Essay to the department, you do not need to complete the Statement of Purpose on the CalState Apply application. Simply write “Essay will be submitted directly to department” in this section. Unless you are applying to another CSU program that does not require a supplemental application, you do not have to complete the Transcript Information, Experiences, and Achievements sections of CalState Apply as those items will be addressed in the supplemental CSDCAS application. Complete the online application after receiving your SDSU Red ID #, which may take up to three weeks after submitting the CalState Apply application (Step 1). Essay and Resume will need to be uploaded to the online application. Essay should be no more than 3 pages, double spaced. Essay prompt is: What sets you apart or makes you unique as an individual, a prospective graduate student, and a potential contributor to this profession? Consider, for example, your experience with academics, volunteerism, research, cultural and linguistic diversity, and work. Why would our program be a good fit to help you reach your unique goals? Official transcripts must also be mailed to CSDCAS. Instructions for submission are on the CSDCAS website. Three letters are required. Letters from former Professors are preferred but not mandatory. Letters are due by January 12. You will be able to follow the status of your application through CSDCAS to see when letters of recommendation are received. Customer Service Phone: (617) 612-2030 Open Monday-Friday, 9am-5pm EST. Step 3 – Submission of Official GRE (and TOEFL, if applicable) Test Scores to SDSU by January 12. It takes ETS 10-15 days to submit test scores to SDSU, so please plan accordingly. Contact the Educational Testing Service (ETS) and request that your GRE scores be sent electronically to San Diego State University (Institution Code 4682). GRE scores can be submitted any time as they go into a master database, which is automatically searched to match scores to applicant. ETS purges electronic test scores after 5 years. If you took the GRE more than 5 years ago, you will need to retake the test. TOEFL scores are required, if applicable. Contact the Educational Testing Service (ETS) http://www.ets.org and request that your TOEFL scores be sent to both San Diego State University (Institution Code: 4682) and to CSDCAS (Code: C122).TOEFL is the Test of English as a Foreign Language. This is only required for international students whose schooling thus far has been in a language other than English. TOEFL scores expire after 2 years. Step 4 – Submission of Transcripts, hard copy or electronic, from All Institutions Attended. Be sure to begin this process early in order to ensure they have all been received or postmarked by January 12. Do not wait for Fall grades if doing so will make you miss the January 12 deadline. Graduate Admissions will not process any transcripts received or postmarked after January 12. OR send Electronic Copy: If your school offers this option when requesting transcripts, choose SDSU from the pulldown menu. If SDSU is not an option on the pulldown menu, ask your school to send to: TranscriptsForSDSU@sdsu.edu. Electronic transcripts MUST come directly from your school. Electronic transcripts sent by students will not be accepted.  NOTE: Submit transcripts to SDSU Graduate Admissions after submitting the CalState Apply online application and receiving your SDSU Red ID. Be consistent in the name you use when submitting applications, transcripts, and test scores – Otherwise, your application and documents cannot be matched by SDSU Graduate Admissions. NOTE: Students who received their undergraduate degree from SDSU do not need to submit an SDSU transcript as Enrollment Services can access those transcripts electronically. If you attended any other universities or junior colleges and these grades appear on your SDSU transcript, then you do not need to submit transcripts for those schools. For all other students, you must submit transcripts from all schools attended even if the grades appear on your degree transcript. INTERNATIONAL DOCUMENTS: If you have international coursework, you must have your school send SDSU Graduate Admissions one official original-language copy of all records of academic coursework and proof of degree. For each document you must also send a certified literal English translation, which can come directly from the school itself or from a professional, certified translator. The translation must contain all information shown on the original-language documents. Country-specific guidelines can be found on the SDSU Graduate Admissions website: http://admissions.sdsu.edu/international/graduate/graduate_country_requirements Please check this page as some international students may need to submit hard copies only, no electronic copies. CHINESE INTERNATIONAL DOCUMENTS: Degrees from China must also be verified by the China Academic Degrees & Graduate Education Development Center (CDGDC). For assistance in calculating your GPA, please use this calculator (xlsx).